More than any other month, February offers the gift of brevity. Don’t blink, or you’ll miss it! You’ll have to be on your toes to catch some of that good Twin Cities theater before March is at the door, demanding your attention. Fear not! I have returned to help you out with my second list of five shows to catch before the month is over, for I am the Theater Genius (Sophomroricitae Efforticus)! Let’s start with The Gentlemen’s Pratfall Club, shall we? Comedy Suitcase has a whole year’s worth of their greatest hits planned for 2015, starting in February with The Gentlemen’s Pratfall Club. After a successful run as part of the 2012 Minnesota Fringe Festival, the show is getting a second life at the Bryant-Lake Bowl. Levi Weinhagen and Joshua English Scrimshaw in The Gentlemen’s Pratfall Club. Photo provided by comedy-suitcase.com. In the show, a struggling actor competes with a French clown to assume the mantle of Captain Clumsy, the host of a popular kids’ show. To win the role, the actor must master the art of physical comedy. Obviously, he’s going to need the teachings of the mysterious Gentlemen’s Pratfall Club. Joshua English Scrimshaw and Levi Weinhagen are the ingenious daredevils behind the show who make an art of wiping out. There are stumbles and sprawls, ranging from subtle to incredibly elaborate. Comedy Suitcase specializes in combining classic comedy, sharp wit, and a goofy sense of fun into a concoction that will crack up kids and adults with equal amounts of gusto. Be prepared for lots of laughs and a little bit of wincing, because wow, that’s got to hurt. The Gentlemen’s Pratfall Club runs from February 20th through March 8th. For tickets and reservation information, check the Bryant-Lake Bowl’s webpage. As I mentioned a little while ago (when I was previewing The Insufferable Spiteness of Beaver, remember that? ), the Bryant-Lake Bowl serves it’s full menu in the theater, and it’s really good. But hey, maybe you want something different. Perhaps give Lagos Tacos a try. It’s right around the corner. This is a good time to be looking for some family-friendly entertainment. The delightful inventors over at the Open Eye Figure Theatre have cooked up a brand new tale of wonder and whimsy, Nothing is Something. Promotional image for Nothing is Something. Image provided by Open Eye Figure Theatre. 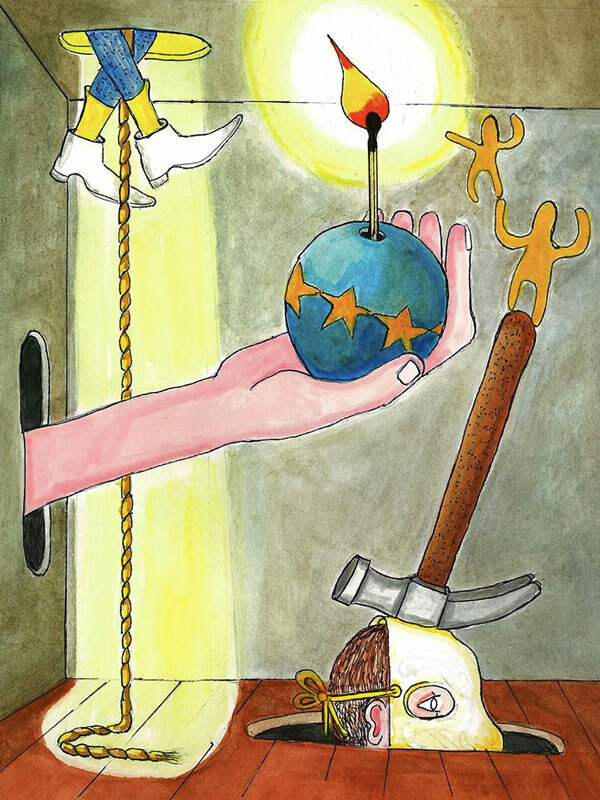 In the show, a young wanderer falls into a strange, other-worldly workshop. This land of of oddities holds plenty of hidden mysteries, including a second enigmatic traveller. It sounds simple but Open Eye has a knack for using their puppetry skills to find magic in simple things. The show features Noah Sommers Haas and Liz Schachterle, both of whom appeared previously in the last year’s production of Strumply Peter at Open Eye. Joel Sass brings his delightful charm to the director’s chair. The show runs February 20th through March 8th and information about showtimes and reservations can be found via Brown Paper Tickets. Open Eye is just a few blocks away from Nicolet Ave, which is flush with good places to eat. Check out the show and give the Bad Waitress a try! 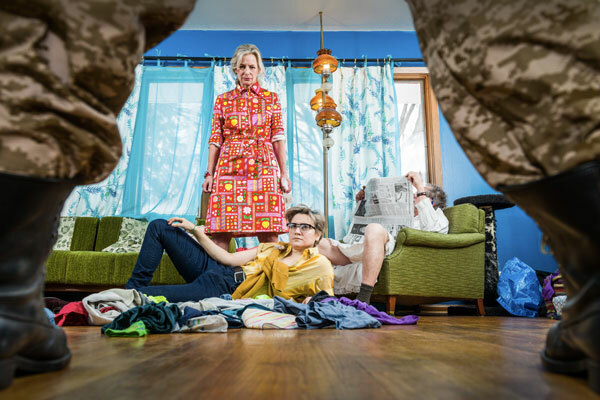 Mixed Blood Theatre Company brings Taylor Mac’s comedy of familial role-reversal to the stage this month. Hir tells the tale of a veteran of the Afghanistan war coming home to find his home in literal and metaphorical disarray. The show promises to be a fun blend of classic farce and modern absurdism that deconstructs traditional gender roles. The play takes its title from the term “hir,” a relatively recent invention. It’s a gender-neutral pronoun used in place of “him” or “her” in cases where a gender cannot be assigned or it is inappropriate to do so. In the case of this story, Isaac returns home to find his ultra-masculine father has suffered a stroke and has been replaced as head of the household by his mother. The sibling Isaac once took to be his sister has now revealed hirself as transgendered. The show features the considerable talents of Sally Wingert, who won another Ivey Award just last fall. The production runs from February 27th through March 22, 2015 and tickets can be guaranteed by visiting Mixed Blood’s website. And for folks who don’t have the funds to reserve a ticket, Mixed Blood has their amazing Radical Hospitality policy. No excuses now for missing this show! And if you’re looking for a place to eat and grab a drink afterwards, might I suggest Town Hall Brewery? It’s just up the street. Here’s a chance to have a show mess with your mind! Who could say no to that? 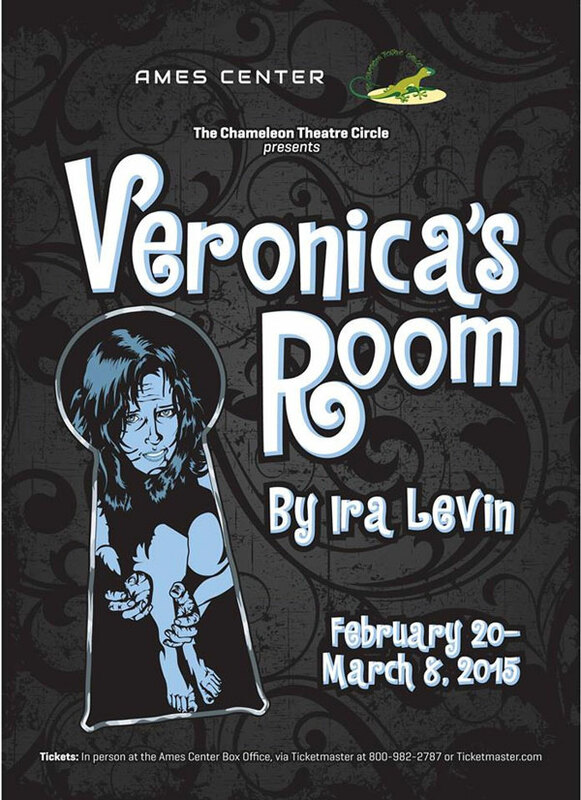 The Chameleon Theatre Circle presents Veronica’s Room, a tale of an assumed identity and psychological intrigue by Ira Levin. Promotional image for Veronica’s Room. Image from chameleontheatre.org. Chameleon started up 17 years ago to bring theater to the exotic lands of Burnsville and that mission continues with this, their 97th production. The show’s main character assumes the identity of a dead woman and discovers a world of madness and terror. Playwright Ira Levin is the same devious mind behind Rosemary’s Baby, so you know you’re in for some serious chills. Veronica’s Room runs from February 20th through March 8th at the Ames Center in Burnsville. Visit Ticketmaster for information about showtimes and reservations. Bring your appetite with you and have some dinner at Buca di Beppo nearby. 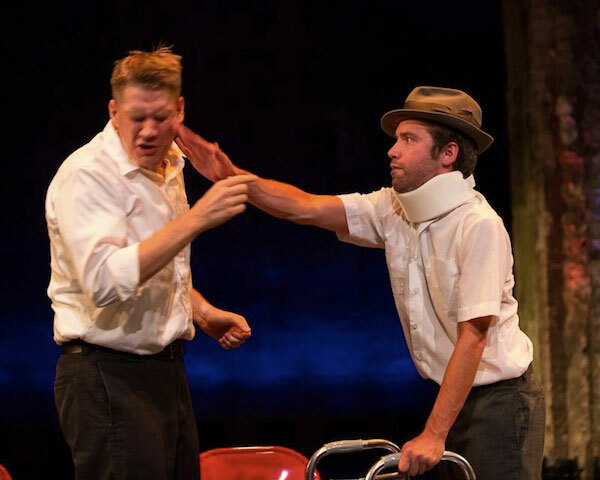 In full disclosure, I directed Shadow Horse Theatre’s production of Jonathon Yukich’s American Midget, so take my enthusiasm for the show with a grain of salt. That being said, I recommend everyone in the world see this show. It is a directorial triumph the likes of which won’t be seen again in this world until I direct something else. 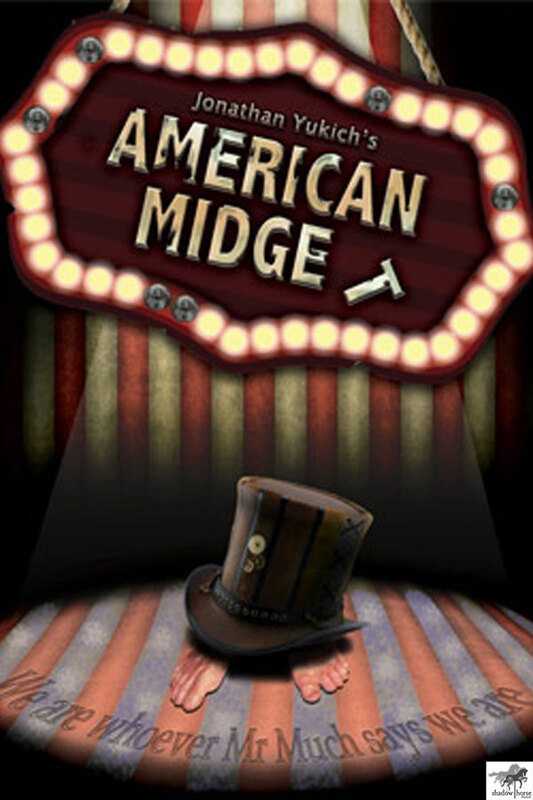 Promotional image for Shadow Horse Theatre’s American Midget. Image provided by Shadow Horse Theatre. Pardon my indulgences. This performance is Shadow Horse’s follow up to their production of Neil Gaiman’s Murder Mysteries: A Play for Voices last fall. American Midget tells the story of Albert, an aspiring artist followed throughout his life by a sinister ringmaster. This ringmaster, named Mr. Much, repeatedly labels Albert with the demeaning epithet, “midget,” despite Albert standing at a rather average height. Shadow Horse seems to have a fondness for dark blends of comedy and fantasy such as this and they do it very well. This time around, their work is appearing in the newly-opened Phoenix Theater. The show opened earlier this month and runs through February 22nd. Information about showtimes and reservations can be found on Brown Paper Tickets. The Phoenix is right across the street from the Green Mill, because what goes better with absurdism than pizza? Tim is a Twin Cities theater artist and board-game writer/designer. His theater company, Ghoulish Delights, stages tales of horror and suspense, both original and classic. He has also provided writing and design for Eldritch Horror, Middle-Earth Quest, and the expansions to Arkham Horror and Battlestar Galactica: The Board Game.